Following reports that have detailed Apple’s plans for new bezel-less iPad Pro models set to arrive later this year, new information backs these claims up by providing the exact dimensions of the upcoming offerings, while also revealing one important design feature. Although the Silicon Valley-based company’s next iPad Pros aren’t expected to adopt an iPhone X-like notch, a significant reduction in bezels is expected to take place, something that looks set to minimize the size of Apple’s tablets dramatically. Starting off with the larger 12.9-inch model, a total of 25.7mm looks set to be shaved off of the device's height, bringing it down to just 280mm. Moreover, the new width measurement, which looks set to sit at 215mm, represents a reduction of over 5mm too. Also, Apple has managed to shave off 0.5mm of thickness on its largest offering. 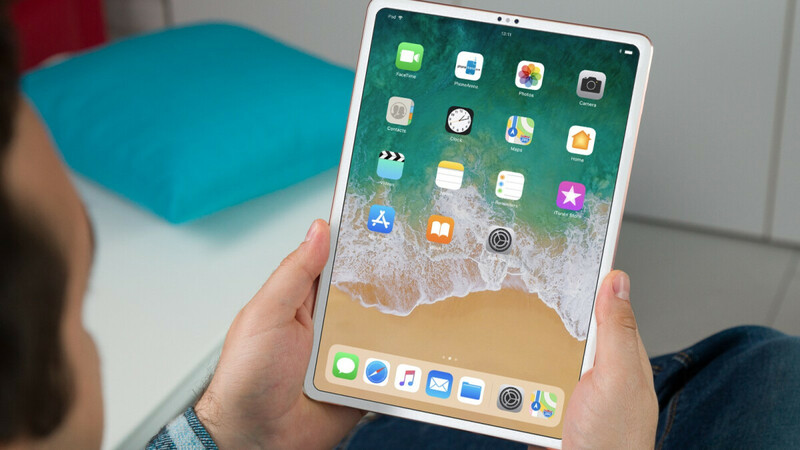 Moving on to the smaller iPad Pro, the current-generation model sports a 10.5-inch display but Apple will seemingly increase this to 11-inches on its 2018 offering. Despite the larger panel, though, the overall dimensions of the tablet are relatively unchanged, going from 250.6 x 174.1 x 6.1mm to 247.5 x 178.7 x 6mm. While the new iPhone-inspired bezel-less design that Apple’s iPad Pros look set to adopt will surely be met with praise by consumers, they may be less pleased to hear that the new tablets could be lacking one popular feature: the 3.5mm headphone jack. Also, unlike Apple's iPhones, the new tablets aren’t expected to ship with 3.5mm to Lightning dongles either. Currently, the new 12.9-inch and 11-inch iPad Pros are expected to become official in the second week of September at Apple’s annual fall event. Here, aside from the new tablets, three new iPhone devices, and the new Apple Watch Series 4 are expected to make their debut. I'm not sure why they wouldn't just increase the screen size of the 12.9 to 13 inches and have the two rounded to 11 and 13 inches. They could also just call it the iPad Pro 13". Wouldn't be the first time a screen size has been rounded. I doubt anyone would care. I have always wondered that about any device. Why not call it whatever it’s close to - no one will care!!! Its Apple, and we'll never know why they wouldn't. There's alot they do that we'll never know. I'll wait for the upgraded version of the MacBook air and see if it's worth it. I have a feeling that either this year or next year they’ll drop the Air and you’ll just have the iPad Pro. They might possibly introduce a more stationary keyboard dock that would make it just like a traditional laptop. The reason I think so is because over the past couple years they’ve really introduced a lot of Mac OS items into iOS for the iPad. And I think with this years launch we might see more cross shopping between a high end iPad Pro and a low end MacBook. Airpods are crap. W1 chip is just for easy pairing, something Android can do for ages. Plus Apple does have the worst bluetooth codec support ... and people can cheer for stupid decisions. I am glad my iPad has a headphone jack. I own 4 wireless headphones and I still use headphone jack when I can. AirPods are great. Keep mine on me all the time. Can’t wait till new Pro and the x plus. My money is ready. I’m with you on that. The best thing Apple has made in years. The AirPods are always in my pocket. Both you, and the original commenter are idiots. How can you appreciate a removal of a key feature. Would you rather have to charge your headphone everytime in order to listen to music? Also quality for wireless is still not up to par with wired. Ridiculous..
Clearly it wasn't key to them. No need to be crass. You can disagree with someone's opinion & still be respectful. Roger, it’s not like you’re unable to use a wired option. I have been on Samsung wagon for years and I have not used the 3.5 jack since note 4. Wireless headphones are great, give you so much distance from your device rather than plugged in. There’s no more of that headphones RIPPED out of your ears because the damn cord snags like all the damn time. They last quite long even the cheap wireless headphones (which is what I’ve been using all the time). And my favorite part - I never have to untangle the damn things ever again - that alone got me to switch to BT years ago. I don’t own Apple AirPods (i do have an iPX now), but anyone I know that owns them - love them. Sound wise and control wise they are subpar alternative to almost any other wireless headphones. I will try next gen. as well of course, but we all can guess probability of me being satisfied with a result. Even 13$ headphones made by QCY sounds better than I. gen. Thinking to get the big one this year, it's starting to sound pretty amazing product. I’m keeping my 12.9 Pro, till it stops working, then I’ll go bezeless. The only thing that will really move iPads is better price. You can get a new iPad today with pencil support for about $350. How much cheaper should Apple make them? things like THIS happens when company ....go NUTS. I see older people having a hard time adjusting to an iPad with no home button and slim bezels that give little room to grab the device. Who still uses wired headphones... pffft. You risk toppling over the iPad when you walk away. Or someone's gonna trip over your wires.